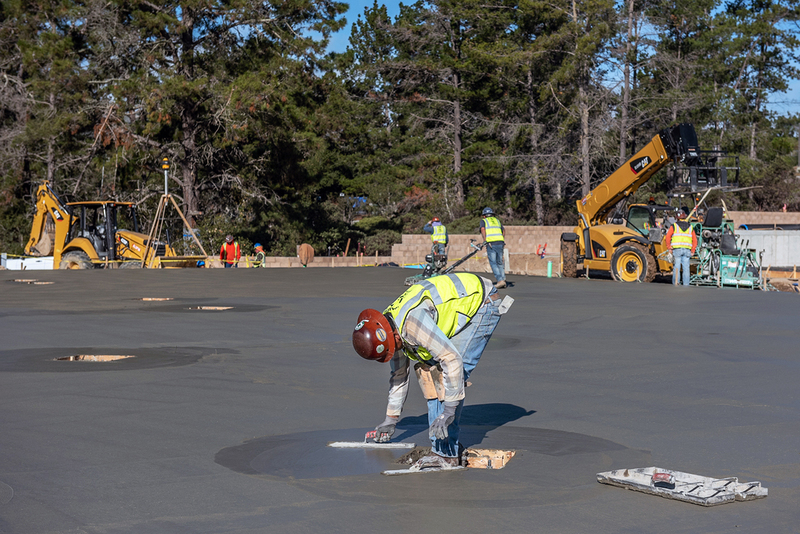 Construction is moving into the fast lane at Monterey Motorsport Park. Taking advantage of a break in the rain this past week, SWENSON Construction conducted the first of several major concrete pours at the luxury garage-condo facility and car community. The initial pour began at 7 a.m., with the last truck arriving at 2:30 p.m. Saw-cutting of the slabs started at around 2 p.m. and wrapped up just before dark. All together, more than 340 cubic yards of concrete were poured to create the slabs for all of Building A and the lower half of Building B at the four-building, 90,000 sq. ft. complex. Assuming that the weather cooperates, the plan is to complete the pour for the remaining building slabs over the coming week. All the prep work is done — the crews are just waiting for some additional sunshine to get the trucks back on-site. Once the concrete has been poured, look for the structural steel supplied by subcontractor, East Bay Construction, to start rising as early as late this week. The use of steel supports is another example of the high-quality construction going into these luxury garage-condos. Monterey Motorsport Park represents the next generation of upscale garage-condos, designed to appeal to car collectors, motorsports enthusiasts or individuals and businesses that need additional, quality storage space. Every unit features roll-up doors to make it easy to move vehicles in and out, standard doors for owners and their guests to enter and leave, and a spacious mezzanine 13 feet above the garage floor. This mezzanine can be customized into a personal office or comfortable weekend retreat with sofa, wet bar, large-screen TV, or other amenities of an owner’s choice.